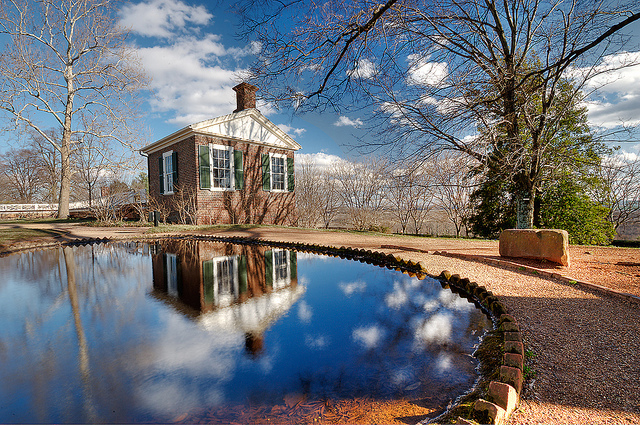 The first building which Thomas Jefferson commissioned - at Monticello - was a small cottage known as the "South Pavillion." It was the place where he and Martha lived immediately after their marriage. For that reason, it is also called the "Honeymoon Cottage." Image by James Marshall ("macjammer"), online via Flickr. Copyright, James Marshall ("macjammer"), all rights reserved. Image provided here as fair use for educational purposes. With the loss of Shadwell, in 1770, Jefferson decided to build a new house (the link depicts his first drawing) at the top of his "mountain." Thus began a process of building, and remodeling, which lasted the rest of his life. Mr. Jefferson was always singing when ridin(g) or walkin(g); hardly see him anywhar out doors but what he was a singin(g). No pictures of Mrs. Jefferson survive, although contemporary accounts describe her as very pretty. According to the Library of Congress, her marriage "dowry almost doubles his land and slaves." In Virginia, winter tends to arrive shortly after the first of the year and, so it did, in 1772. As Tom and Patty returned to Monticello, two weeks after their marriage, they encountered an intense snowstorm. Forced to abandon their phaeton (a four-wheeled carriage), they traveled on horseback. Arriving at the top of Tom's Mountain, in three feet of snow, they spent their first night at Monticello in the Honeymoon Lodge. They shared this small cottage, measuring eighteen by eighteen feet, until they went to Williamsburg in April of 1772. Jefferson scholars believe those months represent the longest time Patty ever had her husband all to herself. As the Jeffersons left Monticello for Williamsburg, Patty was expecting their first child. Like so many women of the time, her own mother had died giving birth. Perhaps it was for this reason that the new Mrs. Jefferson - who was already a bit fragile - had a fear of childbirth. Their first child, however, was healthy, and the Jeffersons named their daughter Martha. The new father and his brother-in-law, Dabney Carr, were members of Virginia's House of Burgesses. Although Thomas had a law office at Monticello, the politics of the colonies soon demanded much of his attention. Bos, Carole "TOM'S MOUNTAIN" AwesomeStories.com. Jul 01, 2008. Apr 20, 2019.